Today we're talking with Kate of Cookie + Kate. Kate shares her love for vegetarian dishes, tasty beverages, and whole food ingredients on her blog. Cookie is her too cute four-legged assistant. Kate has also started a community cooking project where she and other bloggers will cook through Mark Bittman's The Food Matters Cookbook. The project launches on Monday, so make sure to follow along. So Kate, what's your favorite food? 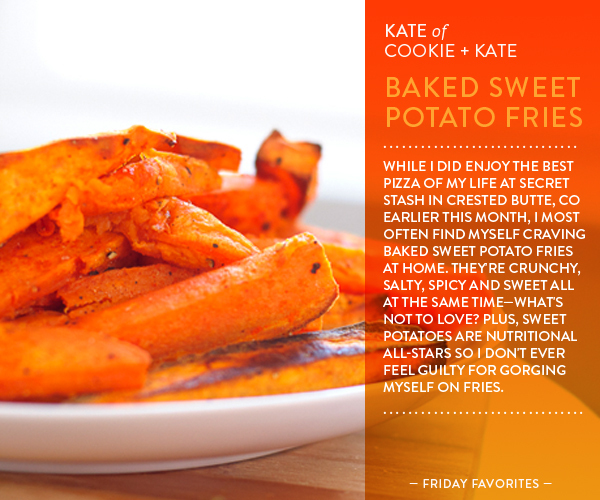 Kate also shows us how to make her favorite baked sweet potato fries here. Thanks for sharing, Kate! Love it! Thanks so much for inviting me to be a part of your new series, Adrienne. Love sweet potato fries. Sometime I will drizzle them with a bit of grade b maple syrup and they turn into dessert. soo yummmy! Hannah - Kate recommends adding cornstarch to make them crunchy. Kate and Cookie had done a great job cooking food that is especially made for vegetarians, and this baked sweet potato fries is surely a hit among vegans. What’s good about it is that the ingredients are nutritious. Sweet potato is packed with vitamin B6, which are essential vitamins for metabolism.